The nomination of Lawyer Maite Orono as a judge of the Supreme Court of Puerto Rico, the first openly gay in being considered for such a high position woman has sparked a series of reactions ranging from the joy of community Lesbian , Gay , Bisexual , Transsexual and Transgender ( LGBT ) to the rejection of religious leaders. Against the designation pastors Wanda Rolon and Dr. César Vázquez , who described the action of the governor Alejandro García Padilla as " disrespectful " to the people " valued " were expressed . 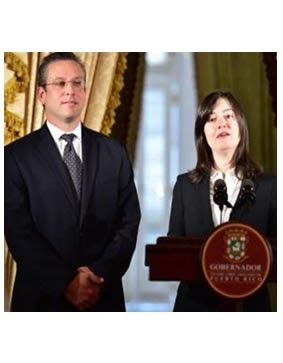 To Rolon, that Oronoz has thanked his partner Gina Mendez looked in their first expressions was an unnecessary action that has tarnished the merits as a professional lawyer . "I understand that she must rather use its merits as a professional and not just get there and impose with that face and here is my companion ; that in a country where still recognizing marriage is between a man and a woman, " Rolon said. "The governor once again we lacked respect for all who believe in family values ​​and established as God ," the self-appointed apostle. For his part, Dr. Vazquez expressed concerned about the " example " that can give the lawyer with their relationship, but especially with the power to make decisions that will have " to alter the values ​​" of the Puerto Rican people. What Do You think about Nomination of Lawyer Maite Orono as judge of Supreme Court of Puerto Rico?